Starr Hall in the Old Stone Row had been conceived of as early as the design and construction of Painter Hail; and in the late 1830s surplus funds from the Old Chapel project gave serious impetus to planning for yet another structure to the south. However, as a joint result of harsh disciplinary action, student revolt, and a Hell-fire-and-brimstone religious revival, the college temporarily lost students and popularity. Only by 1860 had the enrollment regained sufficient size to encourage constructing further facilities. The Old Chapel surplus was substantially supplemented by Charles and Egbert Starr, and the cornerstone laid for the new dormitory, a building very similar to Painter Hall but lent a slightly Victorian flavor by the sharply-pitched gables over the entries. 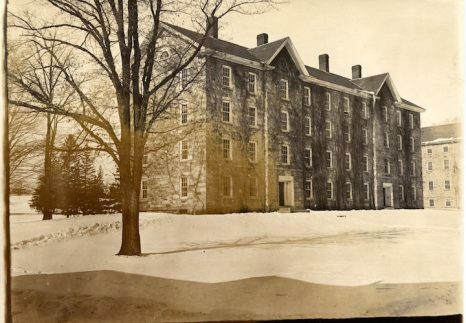 In 1864 Starr Hall burned on Christmas night and was rebuilt within the old shell with further donations by the Starr brothers. However, it was to be a long time before the new structure would be utilized to its fullest. First the Civil War and then disciplinary problems reduced the student body to a low of thirty-eight by 1880. Such were the circumstances of the college when in 1885 Prof. Ezra Brainerd '64 accepted the challenge of the presidency and began to build for the institution new popularity, a liberalized curriculum, an expanded endowment, and new facilities.